If Bet-tina Zilkha's International Best Dressed List extended to couples, the Duke and Duchess of Windsor would be its king and queen. As individuals, their influence on twentieth century fashion was considerable, but combined it was unassailable. From the 1930s to the 1960s, the influence they exercised was all the more apparent for the media attention that magnified their sway on the public's imagination. The Duke of Windsor was born Prince Edward of York on 23 June 1894. With the death of his grandfather, King Edward VII in 1910, his father was crowned King George V. Upon his father's accession, Prince Edward of York became Duke Edward of Cornwall, and on his sixteenth birthday, Prince Edward of Wales. Bessie Wallis Warfield, who was to become the Duchess of Windsor, was born in Pennsylvania on 19 June 1896. Her upbringing, by her own admission, was modest and unexceptional. When she met Prince Edward of Wales for the first time around 1930, she had been married twice. Her first husband was Earl Winfield Spencer Jr., and her second was Ernest Aldrich Simpson, an American living in London. It is generally accepted that the Prince of Wales and Mrs. Simpson began their affair in 1934. Following the death of King George V, the prince was proclaimed King Edward VIII on 20 January 1936. That summer, he took Mrs. Simpson on a yachting holiday in the Eastern Mediterranean. 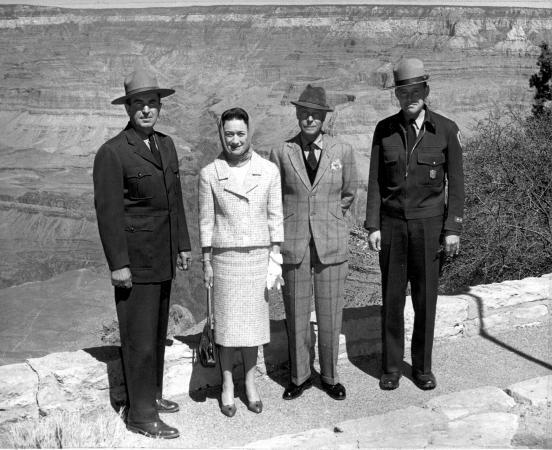 Press coverage of the trip created a scandal, complicating the king's decision to marry Mrs. Simpson. Parliament refused the king's marriage request on the grounds of Mrs. Simpson's status as a twice-divorced foreign commoner. A "Constitutional Crisis" ensued, which resulted in the king's abdication on 11 December 1936. In his abdication speech he explained, "You must believe me when I tell you that I have found it impossible to carry out the heavy burden of responsibility and discharge my duty as King as I would wish to do, without the support of the woman I love" (Ziegler, p. 331). Upon his abdication, he became His Royal Highness the Duke of Windsor, and with his marriage to Mrs. Simpson on 3 June 1937, she became the Duchess of Windsor. The title Her Royal Highness, however, was never conferred upon her. 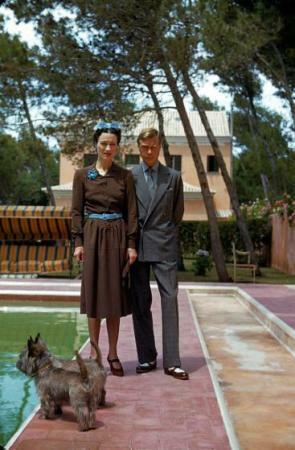 Apart from spending time in the Bahamas during World War II, the Duke and Duchess of Windsor remained in exile in France for the rest of their lives. The duke died on 18 May 1972, while the duchess, who was last seen in public in 1975, died on 24 April 1986. More than any other individual, the Duke of Windsor was responsible for a transformation of men's dress in the twentieth century. His personal preference for rejecting the received notions of Victorian and Edwardian "proprieties" not only influenced the men of his generation, but also-as Chanel is credited for having done with women-created a modern paradigm that persists to this day. What Nicholas Lawford said of him in the 1930s remained true of the Duke all his life, "In a world where men tend to look more and more alike, he seems more than ever endowed with the capacity to look like no one else" (Menkes, p. 95). The Duke of Windsor preferred comfortable clothes that allowed freedom of movement, a style that he described as "dress soft" (The Duke of Windsor, 1960, p. 110). In the 1930s, he was one of the first men to wear unlined, unstructured jackets. From 1919-1959, these were made for him by Frederick Scholte, a Dutch-born, London-based tailor who disapproved of any form of exaggeration in the style of a jacket. As the duke commented in A Family Album, his treatise on style written in 1960, "Scholte had rigid standards concerning the perfect balance of proportions between shoulders and waist in the cut of a coat to clothe the masculine torso" (The Duke of Windsor, 1960, p. 99). The sleeves of the duke's jackets were usually adorned with four buttons, and he preferred welted pockets rather than pocket flaps. Before World War II, Forster and Son in London tailored the duke's trousers. "I never had a pair of trousers made by Scholte," the duke explained. "I disliked the cut of them; they were made, as English trousers usually are, to be worn with braces high above the waist. So preferring as I did to wear a belt rather than braces with trousers, in the American style, I invariably had them made by another tailor" (The Duke of Windsor, 1960, p. 103). For every jacket the duke had made, two pairs of trousers were produced. These he wore in strict rotation. In 1934, along with his brother, the Duke of York, and his cousin, Lord Louis Mountbatten, he replaced the conventional button flies with zip flies. A heavy smoker all his life, the duke instructed Forster and Son to make his trousers with a slightly wider left pocket with no fastening, allowing him easy access to his cigarette case, which he always carried in his left pocket. The duke preferred trousers with cuffs or turn-ups. With the adoption of rationing restrictions in Britain during World War II, which banned turn-ups, he placed all subsequent orders with H. Harris, a tailor based in New York. The London firm of Peal and Co. made the duke's shoes, Lock and Co. his hats, and Hawes and Curtis his shirts and ties. He favored shirts with soft, unstarched cuffs and collars and wore his ties, which he ordered with thick inner linings, with a wide "four-in-hand" knot. Despite popular opinion, the Duke of Windsor did not, in fact, wear a style known as the "Windsor knot." As he explains, "The so-called 'Windsor knot,' was I believe regulation wear for G.I.s during the war, when American college boys adopted it too. But in fact I was in no way responsible for this. The knot to which the Americans gave my name was a double knot in a narrow tie- a "Slim Jim" as it is sometimes called" (The Duke of Windsor, 1960, p. 116). As a keen sportsman, the Duke of Windsor paid particular attention to his sporting attire. In the 1920s, he popularized the wearing of plus fours, which became his standard dress for hunting and sporting pursuits. Disliking the traditional style with fastenings below the knees, he developed a loose-fitting version with a soft cotton lining, which he wore slightly lower than the traditional four inches below the knee. When playing golf, he would wear them with brightly colored Argyle socks and Fair Isle sweaters. Commenting on the Prince at play, Law-ford noted, "He was quite loud in the way he mixed his checks, but he represented style to his generation" (Menkes, p. 102). "I happened to wear it one evening for dinner at La Croe near Antibes, where the Duchess and I lived for a while after the last war. One of our guests mentioned the fact to a friend in the men's fashion trade, who immediately cabled the news to America. Within a few months tartan had become a popular material for every sort of masculine garment, from dinner jackets and cummerbunds to swimming-trunks and beach shorts. Later the craze even extended to luggage (The Duke of Windsor, p. 129). " "I was in fact 'produced' as a leader of fashion, with the clothiers as my showmen and the world as my audience. The middle-man in this process was the photographer, employed not only by the Press but by the trade, whose task it was to photograph me on every possible occasion, public or private, with an especial eye for what I happened to be wearing (The Duke of Windsor, 1960, p. 114). " The Prince of Wales understood that in black and white photography, unlike black, midnight blue allowed the subtle details of tailoring, such as lapels, buttons, and pockets, to become more apparent. It is through these photographs that the Duke of Windsor influenced fashionable men of his generation, and, indeed, continues to influence fashionable men today. Through their designs, Ralph Lauren, Paul Smith, Sean John Combes, and a host of other men's wear designers pay homage to the Duke of Windsor's witty and idiosyncratic approach to self-presentation. As Diana Vreeland (1906-1989), editor of Harper's Bazaar and Vogue, said of him, "Did he have style? The Duke of Windsor had style in every buckle of his kilt, every check of his country suits" (Menkes, p. 126). Unlike the Duke of Windsor's innate sense of style, the Duchess of Windsor's self-presentation, as Suzy Menkes, fashion editor for the International Herald Tribune, has observed, was "a product of rigorous effort rather than inherited or natural taste" (p. 95). She was a picture of elegance, preferring simple, tailored clothes with no superfluous details or decoration. She remained on the International Best Dressed List for more than forty years, and upon her death in 1986, Elle commented, "She elevated sobriety to an art form" (Menkes, p. 95). Being immaculate was the hallmark of the Duchess of Windsor's personal style. As Cecil Beaton (1904- 1980), a British portrait photographer, commented, "She reminds one of the neatest, newest luggage, and is as compact as a Vuitton travelling-case" (Beaton, p. 27). Beaton's first impression of the Duchess, formed in 1930 before she had acquired her title, was less than favorable. He recalled her as "brawny and raw-boned in her sapphire blue velvet" (Tapert and Edkins, p. 92). Four years later, however, when they met again, the Duchess had changed. Beaton commented, "I liked her immensely. I found her bright and witty, improved in looks and chic" (Tapert and Edkins, p. 92). Lady Mendl (Elsie de Wolfe), who remained the Duchess of Windsor's friend and mentor throughout her life, was largely responsible for Mrs. Simpson's transformation. It was Lady Mendl who introduced her to Mainbocher, who was to dress her until he retired in 1971. As Vreeland commented, "Mainbocher was responsible for the Duchess's wonderful simplicity and dash" (Menkes, p. 98). 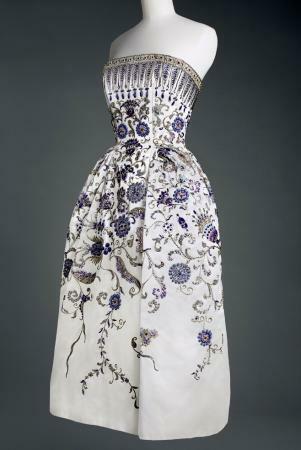 Mainbocher was to make the Duchess of Windsor's wedding ensemble and trousseau. The wedding ensemble included a simple, floor-length dress and matching long-sleeved jacket in "Wallis Blue" silk crepe. The color was specially developed by Mainbocher to equal that of the Duchess of Windsor's eyes. The dress complemented the duchess's style of fashion austerity, being modest but not prudish. Shortly after her marriage, copies of the dress were sold at retailers for a small fraction of the original's cost, from $25 at Benwit Teller to a mere $8.90 at Klein's cash-and-carry. Within a few months, the "Wally" dress made its way to the United States, where it was available from department stores in a variety of styles, colors, and materials. Cecil Beaton became the Duchess of Windsor's unofficial photographer. In this position, he was able to play an important role in the construction and depiction of her public image. Beaton, in fact, took photographs of the royal wedding the day before the actual ceremony. Several weeks before the marriage, he also took a series of famous photographs of the Duchess of Windsor wearing models from Elsa Schiaparelli's Spring/Summer 1937 collection, including the legendary "Lobster Dress" with a print designed by Salvador Dalí. Like Mainbocher's designs, Schiaparelli's clothes appealed to the Duchess of Windsor's rigorous, restrained aesthetic. She liked Schiaparelli's evening suits, in particular, and made them her trademark. Indeed, the duchess was at her most elegant in smart, impeccably tailored suits, a look that Cecil Beaton referred to as her "trim messenger-boy's suits" (Menkes, p. 102). While the Duchess of Windsor's daywear tended to be plain and simple, her evening wear revealed a more feminine, romantic sensibility. As Danielle Porthault of Yves Saint Laurent commented, "Her Royal Highness's style was sobriety by day and fantasy and originality at night" (Menkes, p. 116). During the 1930s, the Duchess of Windsor favored Mainbocher, Schiaparelli, and Vionnet, while after World War II she preferred Dior, Givenchy, and Yves Saint Laurent. These she would wear with shoes by Roger Vivier, who began working for the House of Dior in 1953. According to Vreeland, one of the Duchess of Windsor's many sartorial innovations was the short evening dress. The Duchess of Windsor's recipe of "sobriety by day and fantasy at night" included ingredients of wit and irony, often expressed in her exuberant use of jewelry. Her two favorite jewelers, Cartier and Van Cleef and Arpels, competed with each other to provide the Duchess with ever more lavish and innovative creations. The Duchess of Windsor's simple day suits proved the perfect backdrop for her flamboyant broaches, bracelets, earrings and necklaces, as did her more romantic confections worn at night. One of her more memorable pieces of jewelry was a bracelet made from jeweled crosses, which she wore at her wedding. Each cross represented "a stepping stone in their love story, and a cross they had to bear" (Menkes, p. 151). The Duchess of Windsor once told her friend and confidante Elsa Maxwell, "My husband gave up everything for me … I'm not a beautiful woman. I'm nothing to look at, so the only thing I can do is dress better than anyone else" (Tapert and Edkins, p. 97). But she did much more than this. Not only did she dress to enhance the idiosyncrasies of her physicality, enhanced by her coiffure by Alexandre, but she dressed with a consciousness of how her image would be received by both the press and public. As Vreeland observed, "She had a position and dressed to it" (Menkes, p. 138). In this respect, she had a lasting influence on royal women and stateswomen alike, perhaps most notably Jacqueline Kennedy and Diana Princess Of Wales. See also Diana Princess of Wales; Fashion Icons; Fashion Magazines; Men's Formal Wear; Mainbocher; Neckties and Neckwear; Royal and Aristocratic Dress; Elsa Schiaparelli; Tartan. Cecil Beaton. Cecil Beaton's Scrapbook. New York: Charles Scribner's Sons, 1937. Duchess of Windsor. The Heart Has Its Reasons. New York: D. McKay Company, 1956. Duke of Windsor. A King's Story. New York: Putnam, 1951. --. A Family Album. London: Cassell, 1960. Menkes, Suzy. 1988. The Windsor Style. Topsfield, Mass. : Salem House Publishers, 1988. Sothebys. The Duke and Duchess of Windsor. New York: Sothebys, 1997. Tapert, Annette, and Diana Edkins. The Power of Style: The Women Who Defined the Art of Living Well. New York: Crown, 1994. Ziegler, Philip. King Edward VIII. London: Collins, 1990.